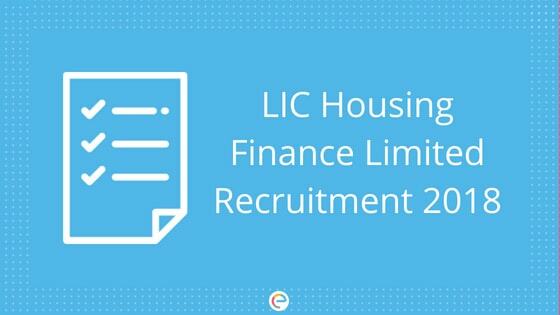 LIC HFL Recruitment 2018: The LIC Housing Finance Limited (LIC HFL) have recently released the LIC HFL Recruitment Notification for the recruitment in the post of Assistant, Associate, and Assistant Manager all across the country. A total of 300 vacancies have been announced for all three posts. LIC, being one of the top government organizations in the country, is a great place to work. The online registration for the exam has already started and if you are eligible, you can apply for the exam till 6th September 2018. Before applying for the exam, you must go through the official LIC HFL Recruitment Notification thoroughly. In this article, we will provide you with all the necessary information regarding LIC HFL Recruitment 2018 – state-wise vacancies, eligibility criteria, how to apply, exam pattern, important dates, etc. Read on to find out. As you can see, there are 150 vacancies for Assistants and 50 vacancies for Associates in various branches of LIC HFL across the country. In addition to that, there are 100 vacancies for the post of Assistant Managers, thus, making a total of 300 vacancies. Assistant Candidates must be a graduate in any discipline from any recognized University with a minimum 55 percent aggregate. Associate Candidates must be a graduate in any discipline from any recognized University with a minimum 60 percent aggregate as well as be CA-Inter. Assistant Manager Candidates must be a graduate in any discipline from any recognized University with a minimum 60 percent aggregate and have completed a two years full time MBA/MMS/PGDBA/PGDBM/PGPM/PGDM course in any discipline with minimum 60 percent aggregate marks. Step 1 Logon to lichousing.com. Step 3 Under “Job Opportunities”, you will see “Recruitment of Assistants, Associates and Assistant Managers”. Click on the link provided to apply online. Step 5 Read the instructions and click on “Continue”. Step 6 Enter your Name, valid Email ID, valid Mobile Number, and Security Code and click on “Save & Next”. A Registration Number and Password will be generated for you and will appear on the screen; the same will be sent to you through the registered mobile number and email ID. You can use these to login later and finish filling up the application form. Step 7 Upload scanned copies of your Photograph and Signature and click on “Save & Next”. Step 8 Enter your Personal, Academic and other details, like post you are applying for and click on “Save & Next”. Step 9 Check if you have entered the correct details and click on “Save & Next”. Step 10 Upload your hand-written declaration. Step 11 Go to the “Payment” tab and make payment of LIC HFL application fee. Step 12 Click on “Submit” and take a print out of your online application form for future reference. In addition, 18 percent GST will be charged. Application Fee can be paid only in the online mode, through Credit Card, Debit Card or Net Banking. Photograph should be a recent, passport size photo. Preferred dimension of the photograph is 200 x 230 pixels. Size of the photo should be 20 to 50 kb. Signature should be with black ink pen on a white paper. Preferred dimension of the signature should be 140 x 60 pixels. Size of the signature should be 10 to 20 kb. Signature should not be in ALL CAPITAL letters. Left Thumb Impression should be with black or blue ink on white paper. Preferred dimension is 240 x 240 pixels in 200 DPI (3 cm X 3 cm). Size of the left thumb impression should be 20 to 50 kb. Hand-Written declaration should be with black or blue ink on a white paper. Preferred dimension is 800 x 400 pixels in 200 DPI (10 cm x 5 cm). Size of the hand-written declaration should be 50 to 100 kb. Hand-Written Declaration shouldn’t be in ALL CAPITAL letters. Each of these sections are timed separately and there is negative marking for wrong answers – 0.25 marks to be deducted for every wrong answer. The exam will be different for the three different posts. The selected candidates, who score high enough in the online examination, will be called in for Interview. Final selection of candidates will be based on the combined score of the candidates in Online Exam and Interview. After that, Medical Examination will be conducted and then the candidates will be recruited in the respective posts. Separate LIC HFL admit card / hall ticket / call letter will be issued separately for each stage of the exam. Candidates will have to login using their Registration Number and Date of Birth to download the admit card. The admit card will contain all the necessary information regarding the candidate and the exam (like exam center, address, etc.) as well as other guidelines. If you fulfill the LIC HFL eligibility criteria, you must apply for the exam as early as possible and start your preparation. It is a very competitive exam with lakhs of candidates appearing for it. You must be extremely good at all the topics in the syllabus of LIC HFL exam in order to crack the Online Exam with a high score. Also, you must take sufficient number of LIC HFL mock tests to identify your weaknesses and improve your test-taking skills. As the syllabus and exam pattern of LIC HFL exam 2018 is almost similar to that of other exams for government jobs, you can take mock tests for any of those exams, like SBI PO, SBI Clerk, IBPS PO, IBPS Clerk, etc. At Embibe, we provide free bank PO mock tests that will be extremely helpful during your LIC HFL preparation. Make the best use of these mock tests and ace the exam. We hope this detailed article on LIC HFL Recruitment helps you. If you have any query regrading LIC HFL Recruitment, feel free to comment below. We will definitely help you out. All the best!